Do you like Politcs? Yes? No? Could care less? Well in this grande topic we discuss politics. Here is a test for those curious. Don't take the test too seriously, and post your results if you want to. 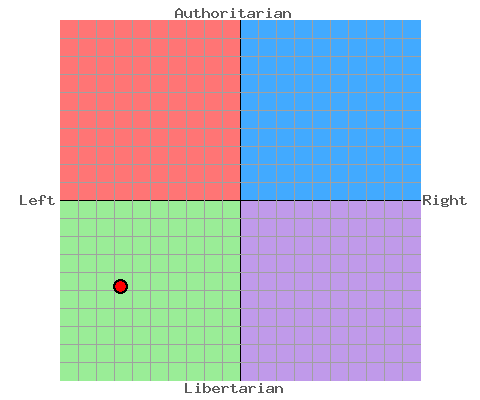 My results lean heavily towards Liberty and Communism/Socialism. The stupid image extension isn't allowed on Talk Chelsea. Smack bang in the middle. In that respect the test was fairly accurate in representing my particular political views; I am not actively politically engaged as some people may be, which is ironic for a historian. Certainly not modern politics anyway. 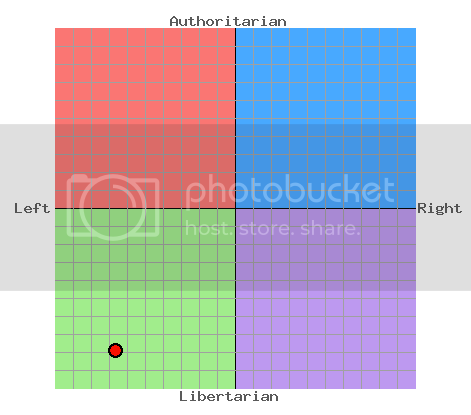 However I am certainly someone safely in the middle as I often express pro-commerce and nationalist (as in patriotism) opinions at the same time as being an advocate of civil liberties. Self-explanatory, I guess. Pretty decent test. Also in the green. Slightly. I'm in purple. Quite libertarian and slightly right-winged. Not a bad test. For the greater good, comrade. The proletarian revolution shall come swiftly. The blind masses accuse Obama of being a Socialist. They shall crush them with cold truth. I did that test a while ago but such results don't change. Mine, but I really don't care about politics to be honest. trying to post mine but it says you are not allowed to use that image extension on this community ? Mine was in the almost identical spot. In fairness, I think even Hitler would score on the left in that test. 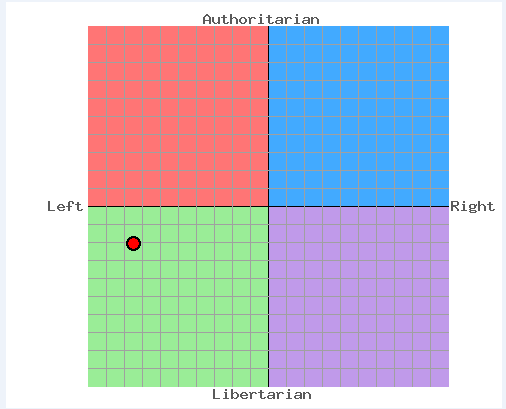 Left principles are very perfect in theory but lack a lot of practicality imo.